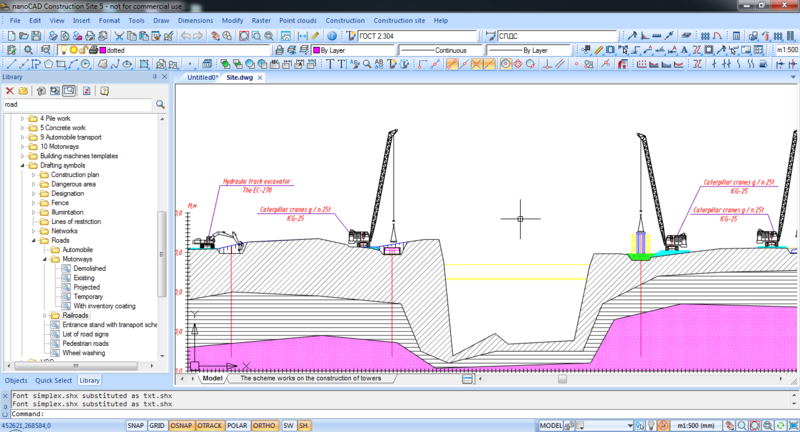 nanoCAD Construction Site is a feature rich application that natively supports *.dwg. 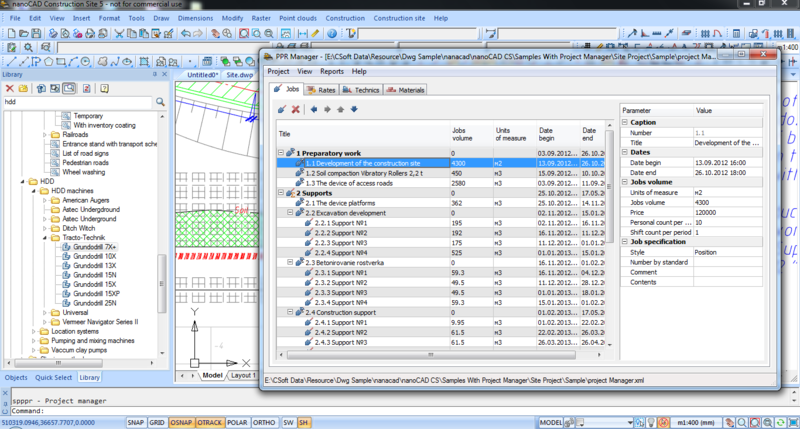 It combines all functionality of nanoCAD Construction and nanoCAD Plus with advanced tools for a construction site development and for planning and organization of the construction process. 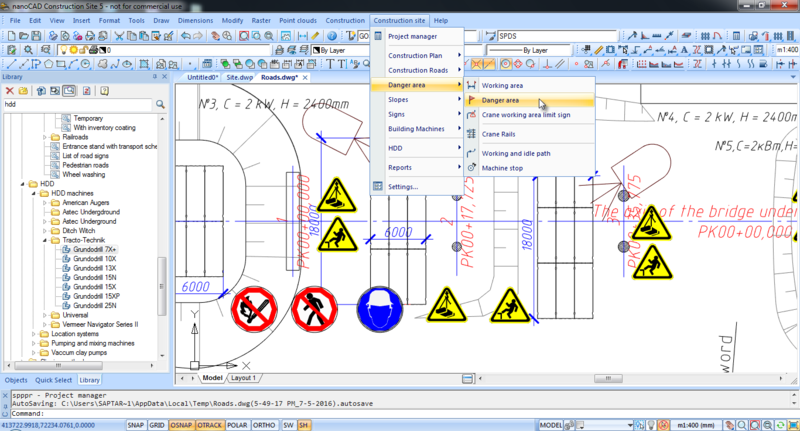 nanoCAD Construction Site is specially designed to automate the design drawings for the Construction Management Project and Work Performance Project. The application is great at coping with both graphical and calculations tasks with an extensive database of library objects. 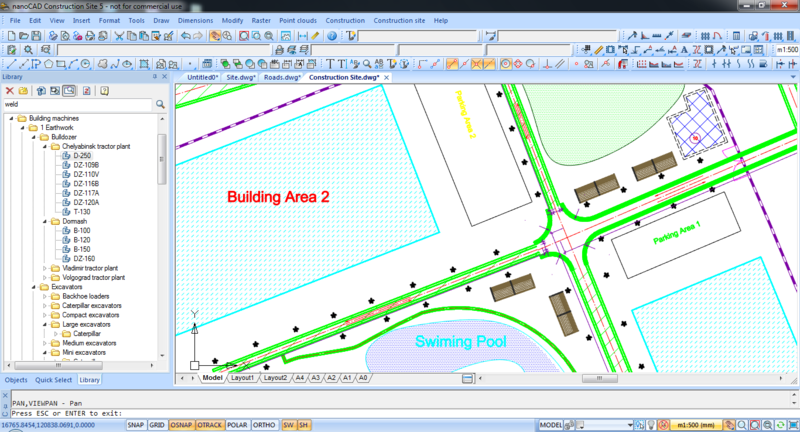 By using nanoCAD Construction Site construction engineers can certainly save time, effort and resources, as well as can improve the quality of the project documentation. 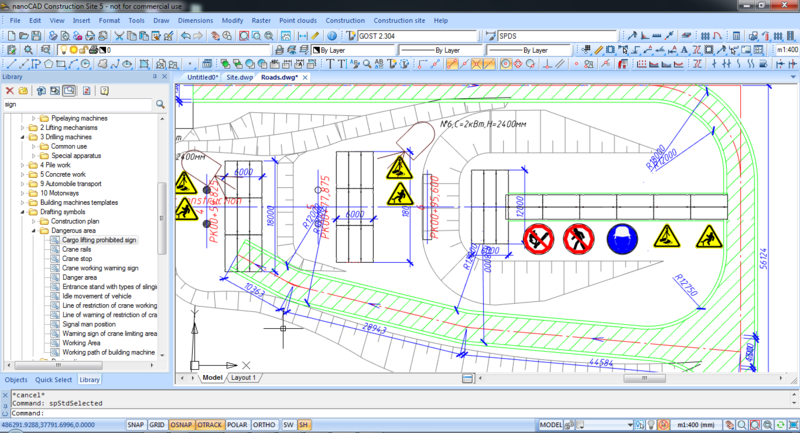 nanoCAD Construction Site is a feature rich application that certainly save time, effort and resources, as well as it improves the quality of the project documentation. 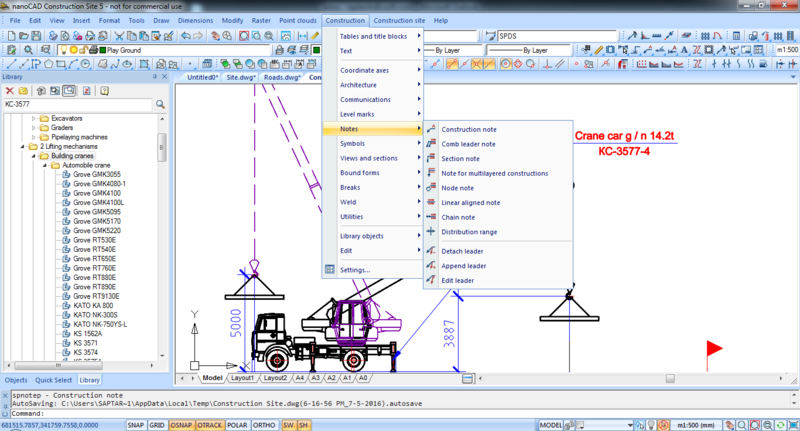 nanoCAD Construction Site consist of more than five thousand standard library object. An important function is to support nanoCAD own database in MS Access format. At present, the database contains ready-made templates ready to use, tabular forms, format sheets, mounting parts, foundations and piles, which are available in different state standards. Site layout is an important phase of any construction activity from beginning to end. The impact of good layout practices in terms of time, money, and construction efficiency increases with the size of the project. Construction site layout involves identifying, sizing, and placing temporary facilities (TFs) within the boundaries of the construction site. The module is designed to work with the roads, it is capable of applying to the plans refer to various types of road, rail and pedestrian roads. For roads and footpaths settings are configured in a special dialog. There is an option to select the desired type of road, its geometry and setting the display components, with given pavement structure. Horizontal directional drilling or HDD, is a steerable Trenchless method of installing underground pipe, conduit, or cable in a shallow arc along a prescribed bore path by using a surface-launched drilling rig, with minimal impact on the surrounding area. The HDD is used when trenching or excavating is not practical. It is suitable for a variety of soil conditions and jobs, including road, landscape and river crossings. 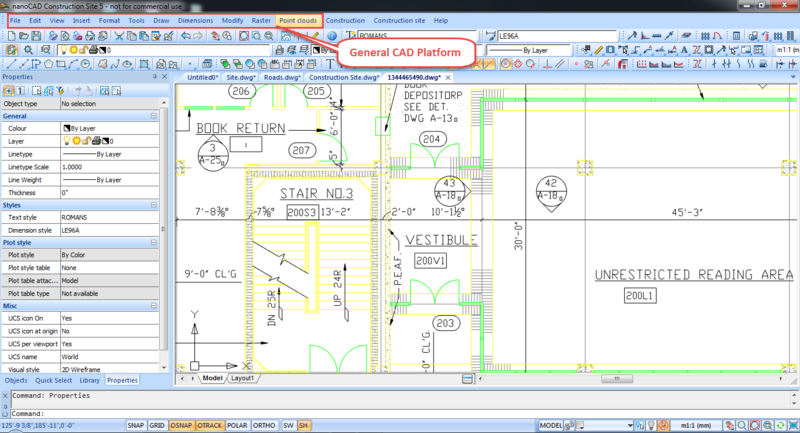 nanoCAD – is a compact, robust and comprehensive CAD, perfect for 2D design and drafting. A friendly and usable traditional interface and the capability to use traditional working methods makes this software a universal tool, almost every designer can work with it. nanoCAD is used for the creation and editing of vector primitives (graphic elements) and more complex objects (blocks, dimensions and etc.). User can insert and use a raster image as a background file. 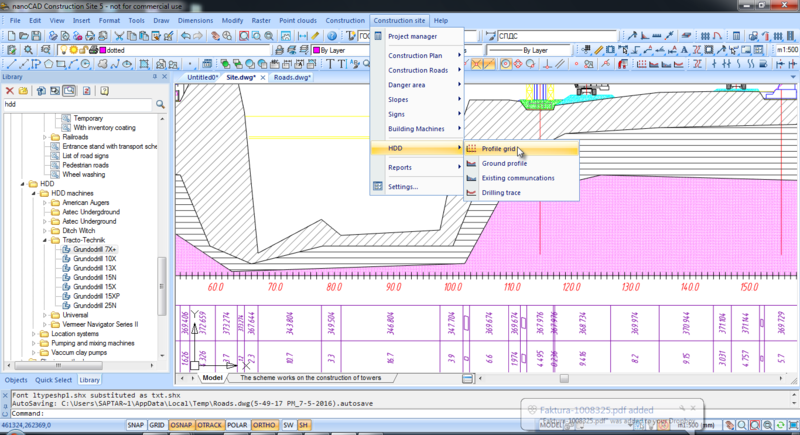 It contains built-in display tools to view different 3D geometry from *.dwg files. 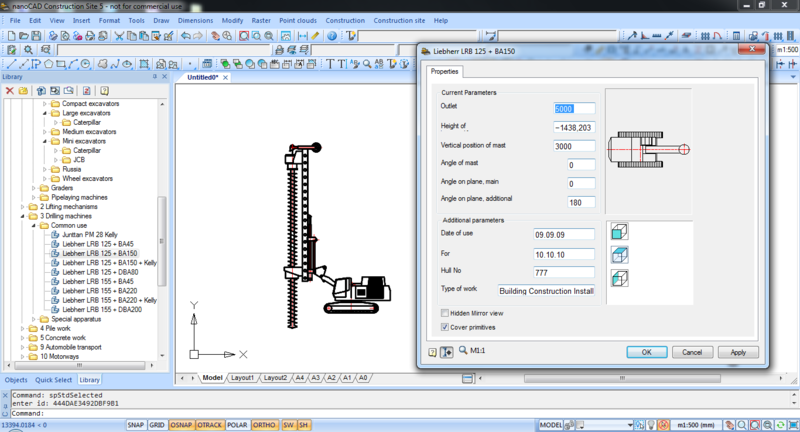 Objects in nanoCAD Construction Site possess intellectual properties that appear in the interaction of objects with each other and with the editing. Objects are represented by a single set of primitives that make them, and work as a unit. Site layout and organization are important management functions which influence all aspects of work on a construction site-from construction methods and sequence to health, safety, and productivity. The design of site layouts is often arbitrarily carried out without a full evaluation of all the relevant factors. The organizational framework within which many projects are carried out also leaves much to be desired with lack of adequate structures and facilities for managing safety. The Site Project Management helps to manage the project data. Works can be selected from the qualifiers and added arbitrarily. For each job there are assigned data on the volume of work, start and end dates. The works are arranged in a hierarchical structure. For each job there are assigned prices, equipment, personnel and materials.